Blacktron New And Improved - "Blacktron New And Improved"
Blacktron was the first Lego Space theme to present a group of astronauts that were not the classic space agency. 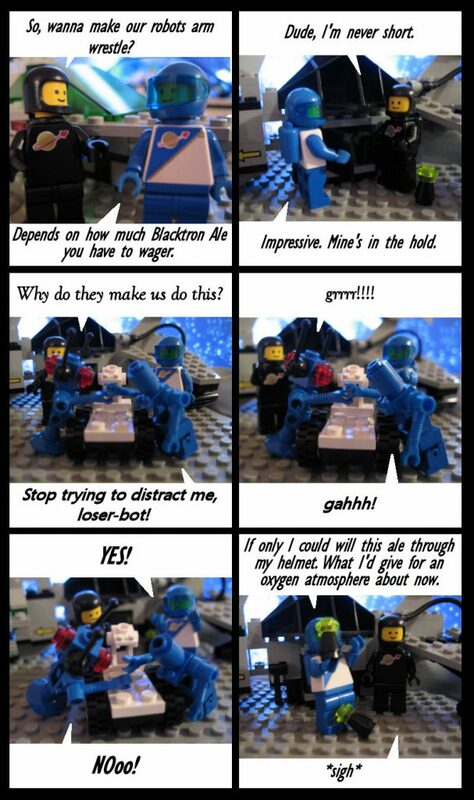 Blacktron were the villains of the Lego Space saga, made obvious by their choice of jet black spacesuits, vehicles and bases. Lego later produced Blacktron II, a series which had some really cool designs. The new Blacktron outfits seemed a little too colorful, though, and not very menacing. Looking back at this first comic, it’s funny to think that it was just meant as a joke about ships with separable cockpits. All the winding storylines and most of the characters hadn’t been thought of yet. The only planning I had done was an outline for the story “Meteor Madness,” which was originally intended to be the debut adventure. I decided, however, that it was too complex for me to handle right out the gate. Instead, I started with some quicker comics that would introduce the characters. Also, looking back, I see how I’ve improved. The photography is (mostly) better. It took me awhile, but I eventually figured out how to use anti-alias in my paint program to smooth out the lines in the speech balloons. In the first few comics I also had a problem with the placement and size of the panels, until someone told me that the layout tended to cause the reader to view the word balloons in the wrong order. I think at some point I’ll go back and correct these problems, especially if I do a print edition of the comics. This was the beginning of the UFO storyline, which is core to the overall story even if it disappears for a bit now and then. I really like that shot of the alien android observing the base. One more note – the base in this comic was originally meant to be the Space Agency HQ, which totally wouldn’t have been appropriate since it is an Exploriens base. Thankfully, I soon acquired the Inter-Galactic Command Base, a true blue Classic Space set, and the Android Base seen on this page just became Captain Amarillo’s hang-out. And yes, this was also Captain Amarillo’s debut, but more on him later. This page also explained the differences in Space Agency uniforms. This page began the trend of showing Schwartz and Galanos (but mainly Schwartz) doing just about anything but working. Their robots were meant to be featured more often, especially as rivals, but I haven’t used them as much as I’d like. A reader once made a good point that it would have been better if the ship were in focus instead of Lt. Verwaand. Good point; live and learn. Verwaand (which is Dutch for arrogant) is a character who hasn’t yet lived up to the potential I have in mind for him, mainly because he hasn’t shown up a lot. He did, however, show up to bemoan this fact in the Lego Space Advent Calendar. This introduced the ongoing rivalry between Commander Valkyrie and Officer Freundlich, natural enemies true to the Space Police I (and II) sets that always had Blacktron imprisoned in the Space Police’s mobile cells. I really like the angle of the truck in the first panel. From what I’m read, Blacktron actually was depicted as allies of the Lego astronauts in catalogs, but that all changed when Space Police hit the scene, and they needed someone to lock up! The shot of Freundlich’s “expression” while locked in the cell and hearing of his chief’s gas problem was serendipitous. The Chief is a character I like but haven’t found a chance to bring back since this very comic! Space Police 1 and 2 looked very different but were intended to be the same agency, I would think. Both themes were great. While I haven’t seen it noted or discussed anywhere, 2008 is the 30th anniversary of Lego’s Space theme. I’ve decided to celebrate that (in my own twisted way) by introducing a recurring storyline that features the 918-1 Space Transport, a set introduced in 1978. It’s the only set I own from the first five years of Lego Space, but it’s a nice-looking ship. Lego would use its design as the basis for a couple of larger ships, including the legendary Galaxy Explorer. UPDATE: While the first sets from the Lego Space theme were dated 1978, it seems they actually saw wide release in 1979, meaning everyone else celebrated the 30-year anniversary a year after me. Oh, well. I like how the horror movie close-up turned out.